The cult of saints affected everyone in medieval Europe. A voracious souvenir market was one of its consequences. What do holiday souvenirs have in common with pilgrim badges? The former are affordable to make and sell; they are eye-catching and showcase the unique characteristics of their destination through shape, text, colour and images; importantly, holiday souvenirs are nearly always portable. T-shirts, miniature models of buildings or statues, snow-globes, tea-towels, mugs, fabric patches, magnets or metal badges are the kinds of objects we like to bring home. Even if we all went to the same place and bought matching mementos – and the mass produced nature of such ‘tourist tat’ means that inevitably such items are far from unique – the feelings we project onto souvenirs are uniquely shaped by personal memories. In our possession, these objects take on new meanings that transcend their low material quality, or the fact that thousands of other people have got one just like it. If, in hundreds of years time, today’s holiday souvenirs were recovered, what would be left of them? The t-shirts, tea-towels and patches would, most likely, have all but disappeared and while plastic and metal objects might retain their original shape, gaudy surface pigments and bits of text would be faded or lost. It would be strange – even moving ­–­ to see our old trinkets in this state, especially if the popularity of the destinations had dwindled and died. The dystopian assemblage would be testament to places previously buzzing with visitors, journeys, emotions, communities and crowds, as lost as the colour and sheen of the excavated souvenir. This evocative legacy is what we behold when standing before a collective display of medieval pilgrim souvenirs, such as those at the Museum of London or Lynn Museum. Pilgrimage was the primary form of extended travel for ordinary people in late medieval Christendom. It might take them to the next village, or the other side of the known world. Pilgrimage provided a wealth of memorable experiences: new friends, views of unfamiliar lands and the soaring spires of gothic cathedrals, the physical pains and ultimate relief of undertaking a journey and encounters with dazzling shrines. It is no wonder that pilgrims, like the modern tourist, demanded souvenirs at their destination. At first, they simply took stones or shells from the locality, leading in some cases to the erosion of shrines. It is likely that phials and badges were produced both to boost revenues and to limit this kind of damage. Between the 12th and the 16th centuries they were sold in their thousands at famous destinations including Jerusalem, Santiago de Compostela, Rome and Canterbury, as well more locally known locations including Willesden, now subsumed by London, and Wilsnac in the Low Countries. The cult of saints affected everyone in medieval Europe and a voracious souvenir market was one of its consequences. It would be anachronistic to claim too precise a parallel between contemporary tourist souvenirs and medieval pilgrim badges. They must frequently have served a devotional purpose their modern counterparts do not. However, comparing the two can helpfully dramatise a medieval artifact to which time has not been kind. Nowadays, the overwhelming majority of pilgrim souvenirs and secular badges are dark grey and fragmentary, but this was not originally the case. They were, in fact, sparkling, even colourful, objects, carefully designed to appeal to the pilgrim and advertise the shrine. 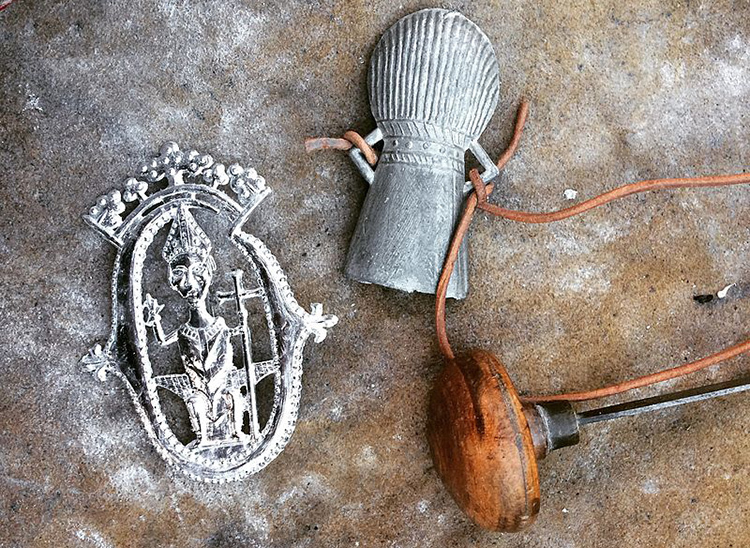 What parallels can be safely drawn between the medieval pilgrim souvenir and contemporary tourist paraphernalia? Affordable material is one. The use of lead alloy was important; though cheap, it lends itself to thin casting and detailed low-relief imagery, allowing for the production of delicate, objects bearing legible pictures. Additionally, it is silver-bright when fresh from the mould. Lead alloy pilgrim souvenirs were affordable for the majority of medieval people, who often collected a range of pilgrim souvenirs over a lifetime. Pilgrim souvenirs were intended to be attractive from a distance and recognisable close up. Their buyers could adorn their hats or bags with a distinctive icon or logo and proceed home, advertising where they had been and their status as a pilgrim, which, it was hoped, would bring them safe passage. Most major pilgrimage sites had at least one, easily recognisable image that could be reproduced on the surface of a lead alloy badge. Santiago de Compostela had a shell; Amiens had John the Baptist's head on a plate; St Albans had an image of the saint's martyrdom (after which the executioner's eyes fell out). Badges from the shrine of Thomas Becket at Canterbury, for example, often showed an image of his bust, the form of the jewel-encrusted reliquary that housed a holy fragment of his skull (the body part sheered off by a sword during his martyrdom). The reliquary bust is a very common subject for Canterbury pilgrim souvenirs, but more unusual examples can also be found. One is the quirky ‘Becket-on-a-Peacock’ souvenir, designed to be fixed to the pilgrim’s customary staff and suspend a small bell. It shows the archbishop standing on the back of a peacock. As the owner walked, the souvenir would have jingled merrily and shone, the protective eyes of the saint and the peacock’s tail facing the long road home. Over the centuries, pilgrims returned home with these objects and enjoyed or forgot them until they were, it seems, eventually consigned to rubbish heaps, old sewers and waterways. Since the mid-1800s, they have been actively unearthed in their thousands, often many miles from their site of origin. They reveal the international journeys undertaken by medieval pilgrims and the great age of our impulse to commemorate experience with tangible souvenirs. While most public collections are in storage, digital technologies are allowing us to simulate the ways in which medieval owners must have turned and scrutinised their badges. In so doing, we can imagine their lost sparkle and the human journeys in which they played a part. Amy Jeffs is a PhD student at the University of Cambridge, researching medieval illuminated manuscripts from England. She is co-convenor of the Digital Pilgrim Project, funded by the Paul Mellon Centre for Studies in British Art.